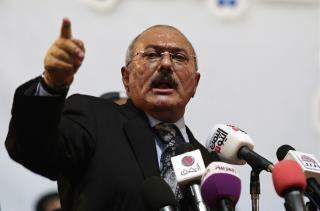 (Newser) – Yemeni rebels killed their erstwhile ally Ali Abdullah Saleh, the country's former president and strongman, as their forces battled for control of the capital, Sanaa, officials said. The collapse of their alliance throws Yemen's nearly three-year-old civil war into unpredictable new chaos, per the AP. The war is widely seen as a proxy battle between Saudi Arabia and Iran, notes the New York Times, which says Saleh's death reduces hopes the conflict will end anytime soon. The circumstances of his death were unclear, but Houthi officials said their forces caught up with him as he tried to flee Sanaa. A video circulating online purported to show Saleh's body with a gaping head wound. It was a grisly end for a figure who was able to rule the impoverished and unstable country for more than three decades and remained a powerhouse even after he was ousted in a 2012 Arab Spring uprising. Saleh's death was announced by the rebels, the Iran-allied Houthis, who've been fighting Saleh's forces for the past week. Two of Saleh's associates confirmed the death, and a third official from the government of Yemen's internationally recognized president, Abed Rabbo Mansour Hadi, also confirmed it. Saleh had previously allied with the Houthis, and the support of his loyalist military units was key to helping the Houthis overrun Sanaa in 2014, driving out Hadi's government. But in recent months, the alliance frayed amid Houthi suspicions that Saleh was leaning toward the Saudi-led coalition backing Hadi. A major question now will be whether Saleh's loyalists—and tribes that support him—can rally to fight the Houthis after his death. And why are we involved in this civil war in Yemen? Because it is at the behest of Saudi Arabia for whom we'd bend over backwards to do almost anything. Trump kowtows to the Saudi's just the same as Obama and Bush.